A familiar face on the ITTF World Junior Circuit, a semi-finalist earlier this year in February in Sweden, the host nation’s Haruna Ojio emerged the player to attract the attention as proceedings began in Kitakyushu in the Women’s Singles qualification tournament that precedes the Seamaster 2018 ITTF World Tour Lion Japan Open. Only 12 years old, a defensive player, she beat Romania’s Adina Diaconu, the former cadet and junior European Youth champion, in five games in their second round encounter (13-11, 8-11, 11-7, 11-9, 11-4). Presently on the Under 15 Girls World Rankings, Haruna Ojio is listed at no.18, having in May been at no.32; on the Women’s listings she is named at no.342, Adina Diaconu is at no.100. Disappointment for Romania and there was more; earlier in the opening round Andreea Dragoman had experienced defeat when facing the host nation’s Emiko Taguchi (8-11, 6-11, 11-8, 11-4, 11-4, 11-6, 11-8). Currently, Andreea Dragoman is ranked no.222. A surprise win and as matters commenced in the Women’s Singles qualification tournament there were more; Korea’s Yoon Hyobin and Wee Yeji alongside Chinese Taipei’s Lin Chia-Hui being players to afford performances of note. No current world ranking, Wee Yeji beat Sweden’s Linda Bergström, named at no.113 (11-6, 11-9, 11-13, 11-6, 11-7); Yoon Hyobin, listed at no.217 accounted for Thailand’s Suthasini Sawettabut, who stands at no.62 (11-8, 7-11, 12-10, 11-9, 11-4). Somewhat conversely, Lin Chia-Hui turned the tables on Korea Republic; she beat Choi Hyojoo (13-11, 11-7, 11-6, 11-8). resently on the Women’s World Rankings, Lin Chia-Hui is at no.398, Choi Hyojoo at no.53. Defeat for Suthasini Sawettabut but, younger sister Jinnipa Sawettabut, ranked no.717 maintained family honour; in her one and only match of the day she accounted for Korea Republic’s Kim Yealin (13-11, 11-6, 12-10, 11-5), a player with no current global listing. Notably, in the early stages of the Women’s Singles qualification tournament, the loss incurred by Choi Hyojoo was one of two defeats experienced by players who had won previously on the ITTF World Tour; Choi Hyojoo prevailed in 2015 in Zagreb. The one other to suffer was the winner in India in 2009; Singapore’s Yu Mengyu, ranked no.47, was beaten by China’s Hu Limei rated at no.675 (11-8, 11-5, 9-11, 11-8, 17-15). Defeat for Yu Mengyu but with greater international exposure, undoubtedly Hu Limei would command a much higher status; in 2014 in Doha she won the Women’s Singles title at the GAC Group 2014 ITTF World Tour Qatar Open. Surprise outcomes as matters commenced but not for the leading names; Sweden’s Matilda Ekholm started her quest with victory over Chinese Taipei’s Huang Yu-Wen (11-7, 11-4, 11-7, 11-9), Portugal’s Fu Yu beat Thailand’s Thanathnan Choosattayanond (11-6, 11-2, 11-4, 11-3). Likewise, Japan’s Maki Shiomi accounted for Nanapat Kola, like Thanathnan Choosattayanond from Thailand (11-8, 11-5, 11-7, 11-3); Romania’s Bernadette Szocs ended the hopes of Korea’s Ji Eunchae (11-4, 11-5, 9-11, 10-12, 12-10, 11-7). 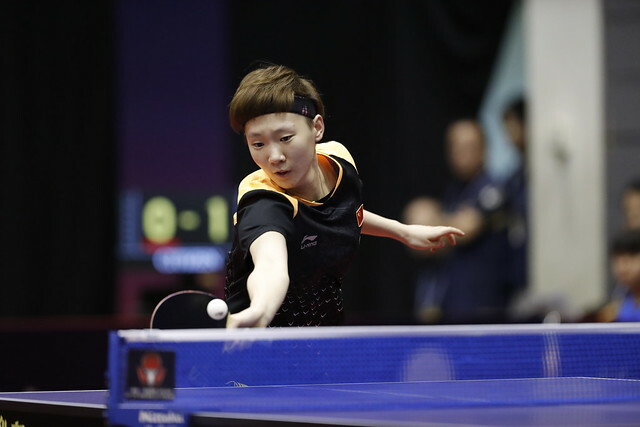 Impressive performances and there was one more of note, China’s Mu Zi, semi-finalist in the Women’s Singles event at the Qoros 2015 World Championships and later in the year the winner on the ITTF World Tour in Sweden, beat colleague Che Xiaoxi (15-13, 13-11, 12-10, 9-11, 11-8).